Easy, delicious, gluten free, grain free, dairy free, nut free, egg free, low salicyate, low histamine, low fodmap pizza base – now you’re thinking that impossible! The good news is that it’s not impossible!! And even better it tastes amazing and it’s so easy you can do it yourself! 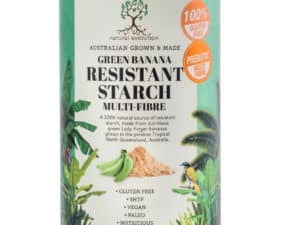 Banana Flour is incredibly versatile and is such a great alternative it can be used on its own and still deliver an incredible result – a new dimension in cooking! Also suitable for vegan and paleo diets. Place water/milk, yeast, oil, sugar, xanthum gum and salt in a bowl and mix well. If using a Thermomix 5 seconds on speed 3. Add flour and mix until well combined. TM 6 seconds on speed 8. Knead with damp hands. TM knead on interval speed for 2 minutes. Roll dough between 2 sheets of baking paper. Remove top piece of baking paper and bake for 2 minutes in hot oven 200C. Cover with your favorite toppings. Bake in hot oven 200-220C until cooked. Cooking time depends on toppings used. Repeat for each base, or freeze for next time.